Dogchild tells the story of a boy named Tarpak and his canine companion, Tarao. When dogs start to go missing, Tarpak and Tarao set out to find what happened to them. The two soon find out that a company called Cornish Inc. may be the ones behind the disappearance of the dogs. Tarpak and Tarao must work together to uncover this mystery. Related reading: The PlayStation 4 is home to a number of heartfelt, honest games from indie developers. Toren, from a Brazilian outfit, is another good example. But the story itself isn't what's important here. What's important is why this game exists at all. 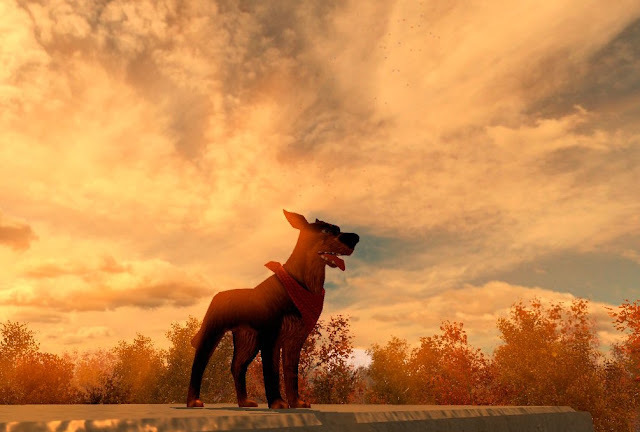 The indie outfit behind Dogchild, a Spanish ten-person outfit called Animatoon, created this game as a tribute to the 20-year canine companion of director, Dario Avalos Modio. If you've ever had a pet before then you're immediately going to sympathise with the creative drive behind this game. And it's an important theme because the game does drip with a honest love of the kind of companionship and friendship between man and animal. That's why it's a non-violent game; because violence would sully the purity of the relationship. That's why it's so focused on the kind of freedom that parkour enables, because that symbolises the excitement and energy of playing with your pet. This is a deeply personal work as a result, and it's almost unfair to review it, because the game does have issues that hold it back, though it's the kind of game that has value despite its gameplay. 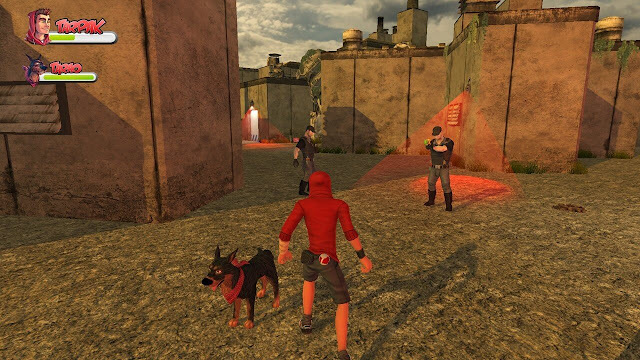 In Dogchild, the player will swap between the two lead protagonists - the boy and his dog. Tarpak - the boy - uses parkour to maneuver around the levels, being able to climb buildings and find hidden collectibles around a level. Tarpak also has a rubber ball he can use to knock out his enemies, and once knocked out an enemy will have a countdown timer over their head and Tarpak must tie them up before they get back up. The ball is bouncy and can ricochet from walls to hit targets. Tarpak can also slow down time for a short period of time so he can hit multiple targets at once. Tarao (the dog, and named after the Dario Avalos Modio's real pet), meanwhile, has his own set of skills he can sniff out points of interest. When sniffing, you will play Tarao in first person view. Tarao can also distract an enemy so Tarpak can target them safely. One last thing Tarao can do is pee... peeing can make the enemy slip and fall but they get right back up again. So, as amusing as it was (and hey, you can honestly say that that is a skill that you'd never by able to give a human character), its use is so limited that I hardly used this skill while playing through the game. There were a few glitches I ran into and a few design issues, suggesting the game was quite ambitious for the small indie developer from a country that isn't well known for its game development infrastructure (and therefore relatively difficult to find of support they need to create truly refined experiences). 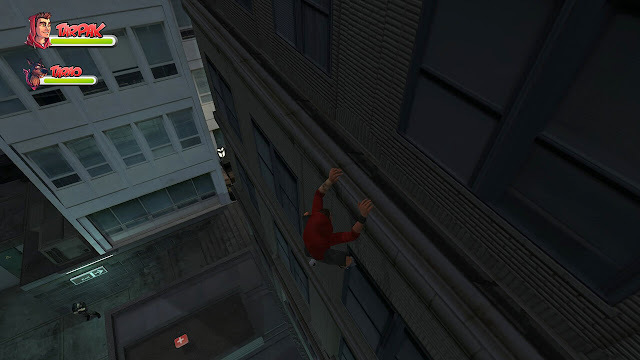 Tarpak would, at times, clip through parts of buildings while climbing, and that's something it does frequently. A design issue I ran into that bugged me were sled riding sequences, where Tarao would be pulling Tarpak around, but if you even slightly touched something it was game over, back to checkpoint. These were needlessly frustrating as a result. One other issue was that when you swap to Tarao, Tarpak will just stand there even if he is being attacked - there's not a lot of AI here, and I do think it is necessary to the game. Other than those few issues the gameplay was decent - it's not the world's most innovative game, but it gets the job done. The game has very little violence; you're throwing a bouncy ball at enemies to incapacitate them, and the enemies use tasers to knock out Tarpak. You get a game over if Tarpak or Tarao lose all their health but in no way did the game ever make you think anyone died. I like this. It's nice to see indie developers working out ways to offer the same basic ideas that we have in the big AAA games without the singular focus on bloodletting for bloodletting's sake. It is a very short game with only six levels, and that will take you around three hours, though there is some additional challenge in finding all the hidden character cards and diary pages. On a presentational front, there is no voice over in the game aside from the dog's barking. This is understandable, given that it is such a indie project which wears its limited budget on its sleeve, but at the same time it's a little disappointing. Voiced characters have an easier personality than those that are mute. For a game that really wants to explore the bond between a person and his animal, it would have really helped the game if Tarpak had some voice work - even if not every line was voiced, but enough to build his personality. The developer's done a good job with both the art aesthetic and music, though, and those do help to set the scene. Related reading: Flying the flag for the Aussie industry, Submerged is another great example of a really personal, heartfelt little game. I did enjoy this experience it was a change of pace from all the violent games that come out these days. The story could have used a little more work and if it did I feel it would almost have been better suited as an animated film, as the core themes that the game explores are a little inhibited by the need to throw "gameplay" in to the mix as well. I also think the Dogchild would have worked better as an episodic game as it ends too soon, likely as a consequence of budget, and perhaps the developer could have done a more substantial work if it had revenue from a first episode to fund second and subsequent episodes. But all of that said the most heartwarming thing about this game is its a tribute to the lead developer's sadly deceased dog companion. For that reason alone anyone who has ever had a beloved pet really owes it to themselves to experience this one.